(Bloomberg) -- While President Donald Trump searches for a way to save America’s coal country, some in his own party have their eyes set on what’s arguably the exact opposite: bolstering solar. Since taking office, Trump has sought to undo his predecessor’s renewable energy-friendly policies, levied tariffs on imported solar equipment and signed tax reforms that depleted financing for clean energy projects. He’s pushed for America to use more of the coal-fired power that solar and wind have helped displace: Just last week, he was said to be considering forcing grid operators to buy electricity from cash-strapped coal plants. That’s put some pro-solar Republicans in a tenuous position. The party’s on pace to receive more money than ever from the solar industry this election cycle based on government records, and lawmakers who are seeing their districts benefit from a renewable energy job boom want more. 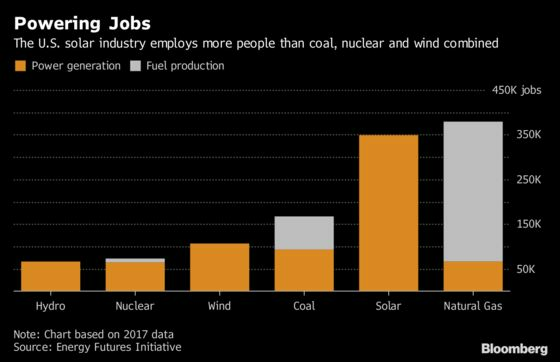 One report showed the solar industry now employs more than the country’s coal, nuclear and wind businesses combined. “I don’t think Trump is reflecting necessarily where Republicans are,” said former Senate Majority Leader Trent Lott of Mississippi, who has lobbied for the solar industry in recent years. Congressional Republicans are increasingly supporting renewable energy as it becomes more competitive, he said, while noting that this hasn’t necessarily created a “a rift” between them and Trump. Trump is facing skepticism from within his own caucus, including from Alaska Senator Lisa Murkowski on Wednesday. And last month, eight Republican senators -- including Thom Tillis and Lindsey Graham representing the Carolinas -- asked Trump’s trade representative to exempt certain panels used for utility-scale solar farms from the import tariffs that the president imposed in January. Republican Senator Dean Heller from Nevada is working on legislation to reverse the 30 percent tax on panels, said Megan Taylor, a spokeswoman for his office. “He is committed to pursuing policies that will increase the production of alternative energy technologies,” she said. Republican Congressman Ralph Norman from South Carolina, who co-founded a congressional solar caucus in February, said he supports an all-of-the-above approach to energy. “All we’re saying is: Look at all the options -- whether it’s through clean coal, whether it’s through solar, whether it’s through nuclear,” he said. There’s also this: 13 of the top 25 congressional districts in terms of solar-generating capacity are represented by Republicans, according to Abby Ross Hopper, president of the Washington-based Solar Energy Industries Association. Nationally, the industry has seen a 168 percent jump in jobs since 2010 -- totaling more than 250,000 last year, according to The Solar Foundation, a nonprofit organization. It’s poised for further growth this year. The U.S. Bureau of Labor Statistics has forecast that solar-photovoltaic installer will be the fastest-growing occupation of the decade to 2026, outpacing health care, information technology and other career tracks. That could play right into Trump’s desire for more domestic jobs. It’s a selling point that’s not lost on the industry. “The No. 1 campaign issue -- whether it’s for mayor or for president -- is jobs,” Hopper said. This also at least in part explains why solar campaign giving has shifted from blue to red. Industry political action committees have contributed $160,000 to Republican candidates and committees so far in this election cycle, Federal Election Commission records show. That’s more than twice the $70,900 Democrats have gotten -- a stark reversal from the giving four years ago. George Holding, a Republican congressman from Raleigh, boasted by email that the renewable energy industry supports 275 jobs in his district and more than 34,000 jobs in North Carolina. “That means renewable energy is a $6.4 billion industry in our state,” he said. Energy policy has almost never fallen perfectly along party lines, especially in the era of Trump. Some Republicans back Trump’s plan to save coal plants. And some Democrats might appreciate another key part of his proposal: keeping nuclear reactors online. Democratic states including New York and New Jersey have already approved multimillion-dollar lifelines for nuclear power, in part to preserve their emissions-free power supply. Lower-cost power has propelled solar deeper into conservative areas. 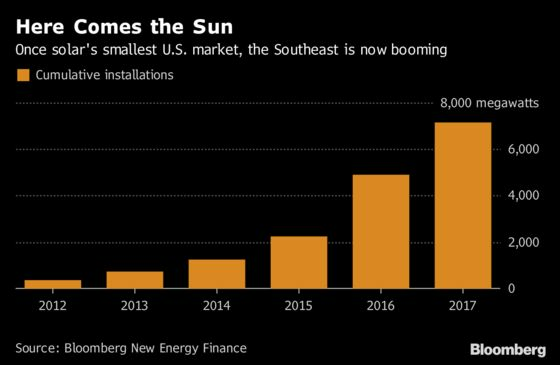 The Southeast, long the country’s smallest solar market, resisted until the power source became cost-competitive. The region installed more than 2.2 gigawatts of solar last year, up from 537 megawatts in 2014, according to Bloomberg New Energy Finance. Today, this southeastern U.S. solar belt overlaps almost perfectly with the geographic base of the Republican party. South Carolina installed almost 332 megawatts last year, up from less than three megawatts in 2014. Strata Solar has built about 160 utility-scale projects, the vast majority in North Carolina. The industry fits comfortably in the countryside, Jackson Naftel, the company’s Chapel Hill-based director of development, said. The ideal location for a solar farm is “in more rural parts of the state that tend to be more conservative,” Naftel said. We’re “helping the tax base for these counties and creating jobs,” he said. They’re going to people like Chris Fitzsimmons, who was once an electrical foreman on Long Island, but moved to Columbia, South Carolina, to take advantage of the coming renewables boom there. He’s now a construction supervisor at Sunrun Inc., the largest U.S. residential-solar company, and is looking to buy a house in the area for his family. He says the people working for him are making $4 to $5 more an hour in solar than they would at other power companies. Some Republicans have long championed solar. Lott was among those who lobbied for Congress’ extension of the industry’s investment-tax credit in 2015. And last year, conservative commentator Sean Hannity warned in an advertisement that tariffs on solar imports could threaten U.S. jobs. A few weeks later, Ballard Partners, led by one of Trump’s leading 2016 fundraisers, disclosed that Sunrun and Vivint Solar Inc. had hired the firm to lobby as the president neared his tariff decision. Ballard declined to comment. But Trump championed coal during the campaign, using miners as symbols of a neglected blue-collar America. His spokesman Hogan Gidley didn’t immediately respond to requests for comment. Alaska’s Murkowski, the chairman of the Senate energy committee, said on Wednesday that she had “more questions on this than I have answers” when asked about the Trump administration’s plan to prop up struggling nuclear and coal plants in the name of national security.